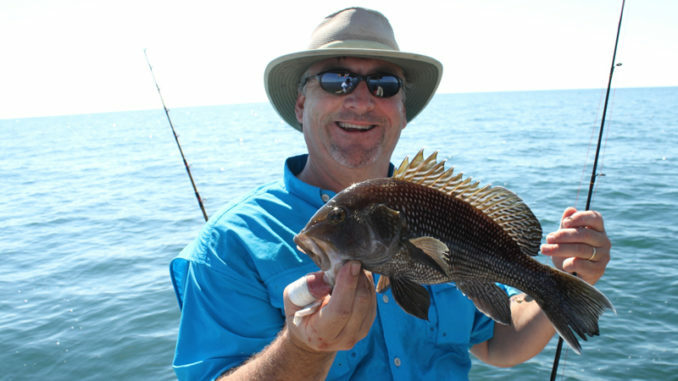 Black sea bass season will run the entire month of February north of Cape Hatteras. The recreational black sea bass fishing season will open Feb. 1 in federal and North Carolina waters north of Cape Hatteras. The minimum size limit will be 12.5 inches total length (tip of the snout to the tip of the tail), and the bag limit will be 15 fish per person, per day. The season will close Feb. 28. The recreational black sea bass regulations north of Cape Hatteras comply with the Mid-Atlantic Fishery Management Council and Atlantic States Marine Fisheries Commission Summer Flounder, Scup and Black Sea Bass Management Plan. The council and commission allow states to open the recreational fishery in February if the season length is adjusted later in the year to account for the February harvest and if the state conducts biological monitoring of the harvest. The open season dates, size limit and bag limit for the rest of the year will be set in the spring. The recreational black sea bass fishery south of Cape Hatteras is managed by the South Atlantic Fishery Management Council. South of Cape Hatteras, the minimum size limit is 13 inches total length and the bag limit is seven fish per person per day. The recreational black sea bass season begins April 1 each year and closes when the quota is met. The 2018-2019 season is open.